Best Commuter Bike Under 200 Dollars You Never Knew Existed! A Guide To The Best Commuter Bike Under 200 Dollars. Well, in most cases, your options are quite limited as far as new bikes under $200 are concerned. Luckily, and somehow surprisingly, commuter bikes are different. And today, I will present all the available alternatives including the best commuter bike under 200. In short, if you’re under a budget and have been hunting for a cheap commuter bike, your chase is like to come to an end by the end of this resource. The reason behind their fairly cheaper costing in comparison with the aerodynamic racing bikes is their cheaper parts and presence of non-sophisticated feature(s). What is a Commuter Bike? A commuter bike is nothing else but a bicycle you use to commute (travel) from home to your place of work, college, or for the occasional shopping. As a matter of fact, the popularity of urban and commuting bikes has triggered an intriguing phenomenon called bicycle commuting in countries such as Denmark and the Netherlands. Here, armies of workers cycle to work every morning creating quite a spectacle in cities in these countries. The Rise Of Commuter Bikes. While the commuter bicycles have always been there, the enactment of the Bicycle Commuter Benefit Act in 2008 gave them an extra boost. Do you remember the bailout bill? The commuting benefit was buried in there and gave a small (up to $20) monthly benefit to workers who would cycle to work. Today, you will meet all manner of commuters on our roads: Hobbyists, fitness enthusiasts, pro-health, lifestyle cyclists, and more. Of course, commuter bikes have been favored by the fact that cycling is considered ‘greener’ vis-a-vis other popular modes. What Is A Good Commuter Bike? A good commuter bike should have certain qualities. These and other factors (more later) were key when we were selecting the candidates for the best commuter bike under 200. For the frame, you want a material that lasts a lifetime. Steel and aluminum alloy frames largely outlast the rest. Like with every other bike, a bad saddle can make you to hate biking for the rest of your life. Whether it’s a cheap commuter bike or a beginner commuter bike, a comfortable seat will keep unnecessary pain and discomfort away. You’ll be better off with tires that perfectly suit your daily terrain. Thinner tires shine in streets while their wider counterparts are kings of rough surfaces. 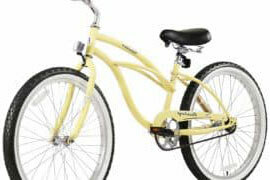 Various styles are available in the best bike under 200 category. You can opt for the classic 3-speed commuter bike with its legendary elegance or choose a utilitarian urban commuter bike and everything in between. Style choice comes down to your taste. You may want to be carrying some groceries, books, or gym gear to or from work. Availability of practical storage (racks and others) is therefore necessary. Nothing is as important as fit and sizing when evaluating the best road bikes under 200 dollars. Of course, you know this: bikes that fit you well are a joy to glide with. Refer to the manufacturer’s sizing chart if unsure. Sleeker and lighter constructions will never weigh you down so the ride is more enjoyable. Grips are one of the smallest accessories but absolutely one of the most influential in determining how cozy your commutes will be. The market is flooded with impressive choices including special ergonomically-shaped brands so take your time. The 28-inch (700c) is quite dominant though the smaller 26-inch and 27.5 inch offer better maneuverability. It’s true that your beginner commuter bike often comes with standard flat pedals (platform pedals). Now, these work well for short to medium distance. You may be forced to upgrade to clipless (or caged) pedals if you do longer distances. Sometimes the teeming traffic can be crazy meaning you need your dream bike to stop on a whim. Finding great brakes is super important so we have prioritized this in our search for the best city commuter bike. The presence of an expansive suspension system means that you can roll along irregular surfaces without feeling the discomforts. How Many Gears Does A Commuter Bike Have? The number of gears in commuter bikes varies a lot. Nonetheless, you will really struggle without the correct gearing. The thing is you require more gears if you frequently cycle on tough climbs. That being said, best-selling commuter bicycles may have anything between two gears and can go up to twenty seven. The key to landing the best commuter bike under 200 is focusing on models that are practical and comfortable for your style of riding. Good for adverse weather biking. Consequently, manufacturers have released numerous kinds as they battle for a share of the expanding commuting community market. You will perhaps fair best with the best commuter road bike if you’re love clocking long distances. You see, commuter road bikes like the Men’s Kent Road-Tech Bike beat the rest in term of comfort- the most essential quality for you to have fun through the many miles. Besides, they are optimized to go fast especially on the tarmac, which happens to be their natural terrain. Here you sit upright thanks to the flat handlebars. This posture is also cozier than when clinging on the drop handlebars that rule on some expensive road commuter bikes. This means you will not be stressing your back or neck and you can ride for hours on end and not feel a pinch. I recommend that you select a model like Vilano Men’s 700c Hybrid Bike Retro City Commuter particularly if you like to get better at cycling uphill. The bike is not only stylish (check the comfortable grips and matching suspension saddle), lightweight, and durable but it’s also multi-speed – it comes with 7 Easy-shifting seven-speed gear system so it’s fantastic for inclines as well as other terrain. And while at it, the linear pull brakes are sure to help you stop at a dime. The Speedy 700c wheels are the icing on the cake for what is a brilliantly designed daily commute, city riding, or campus bicycle. This sub-type is purposed for making frequent short, averagely paced rides through fairly flat urban areas. It could also be awesome for a relaxed afternoon riding with pals and is superb in all pavements. The best urban commuter bike maintains consistent cruising speeds and is among the most stable commuting bikes. The fast moving Retrospec Harper Single-Speed Fixed-Gear Urban Commuter Bike best represents this unsung family of commuter bicycles. The best way to get into commuting is to slowly ease your way in- and this requires that you’ve a commuter bike that’s less intimidating. I am referring to a bicycle with all the basics yet comes maximized to suit the needs of new riders. They are simple yet performers, remains firm even when it rains, and most importantly, have plenty of safety features like outstanding, front and rear braking systems, reflectors, protective guards, and more. It may not be an under $200 but the NowRaleigh Detour 2 Step-Thru Comfort Bike is pretty impressive…. First, there is the step-through frame that will make you find hopping in and out from it super easy. Secondly, the upright geometry, comfy grips, and saddle make it one of the comfiest bikes for starters. Another argument favoring this is the 700 x 40C tires…These have built-in puncture protection so you will rarely experience annoying flat tires. And when you get the hang of biking, the 21 gears will surely make your daily commutes a treat. Women’s commuter bikes stand out from the crowd due to their pretty looks, ease of getting into and out of (the step-through design is recommended), and customized women-friendly extras. For instance, a typical womens commuter bike has shorter top tubes and longer seat tubes to accommodate their usually shorter torso and match women’s longer legs respectively. Still there, the saddle is made wider to cater for the additional distance between women’s sit bones and the narrower handlebars. The market has a number of immensely popular ladies bikes but most, like the sixthreezero EVRYjourney Women’s (one of the very best womens commuter bike)will set you back hundreds of dollars. Luckily, a few including the Retrospec Beaumont-7 Seven Speeds Commuter Lady’s Bike are nearly as good and come at about $200. Trek Bikes Company is one of the most trusted brands in the whole bikes industry because of their long standing association with quality. In the commuting scene, they make one of the most adventurous commuter bicycles and are the top choice for riders obsessed with pleasure, biking freedom and fun in our open roads. If you’re looking for the surest way to cycle while relaxing under the enchanting city sounds and vibes, then you should pick a trek commuter bike. The only drawback is that these bikes have hefty prices and are no go zones for buyers looking for the best budget commuter bike. Men do extremely well with ‘men-tuned’ frame geometry, an accomplished built, and resilient city bikes. Speedsters prefer top notch drivetrains and powerful brakes, for example, the tough hydraulic disc brakes for security reasons. You may also notice other qualities that give mens commuter bikes quick handling characteristics such as ultra-light frames, drop/ racing style handlebars, and narrow high-pressure tires. All in all, we met a couple of inspirational commuter bicycles for the contemporary man at this price level but it’s the Aluminum Road Commuter Bike (Shimano 21) that won us over. You will certainly love the drop bars, the handy water bottle mounts, and undoubtedly, the superior 21 speeds. Folding bikes rides akin to full-sized bikes but you can fold it down in seconds and carry it neatly onto the elevator or have it cozied up conveniently just next to your office desk. These bikes also suit those who don’t intend to be riding the entire distance to work and instead complete part of their journey by public transport. The market leader in the folding commuter class seems to be Columba’s 26″ Folding Bike (with Shimano 18 Speed) as a result of its incredible design that artfully combines the best from the vintage models and the trending. Overtime, you may decide to upgrade as you seek to get more out of your daily rides. May be the next level would be to jump to the under 500 dollars bracket. The best commuter bike under 500 is synonymous with exquisite quality, luxury, and unending delight. This comes from the smooth shifting (a near permanent attribute), generous padding in their seats, upright poise which has you sit pretty all along the way, and more. The Diamondback Bicycles Trace Dual Bike is one of the stars here- it oozes confidence crisscrossing towns and is always eager to take you further. Extras such as headlights, side safety lights, and fenders make your life on the road easier. And while it’s true that some adds on depend on your personal favorites, some such as the best commuter bike helmet are a must-have for your personal safety. I don’t even need to remind you about the grim statistics…cycling without a helmet can have calamitous consequences. Water bottle mounts, spring loaded rear racks (for holding plenty of cargo), front plus rear fenders, LED front, and rear bicycle lighting, and even an anti-pollution mask are all beneficial according to where and how you cycle. There go our recommendations for the best commuter bike under 200 dollars group. Can you see that you are actually spoilt for choice? Remember to consider the fundamental factors I highlighted earlier even as you think of your other personal preferences. Also, don’t forget to drop us your comment or question about commuter bikes under $200 in the comments section.